Natural light- an essential element to life. It’s a proven fact that natural light in the home/office will improve your health and overall quality of life. Not only does light help us feel good and be more productive, inviting light into a dark room will instantaneously make the room more appealing. From structural changes to accessories, there are many ways to arrange your space to make the most out of natural light. To help shed some light on the subject, here is a list of 12 innovative ways to brighten up a dark room. Utilize natural light by replacing your regular door with a beautiful glass door. Whether it’s brightening your hallway with a glass front door or lightening up your living area with glass patio doors, the use of natural light will improve any dim space. 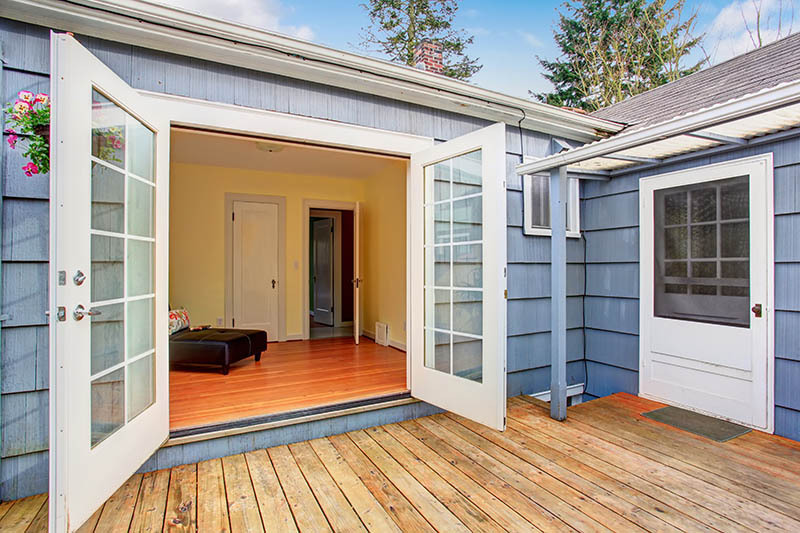 French doors are an option that will add elegance and light to your room- not to mention they are a home improvement that can actually raise the value of your home. 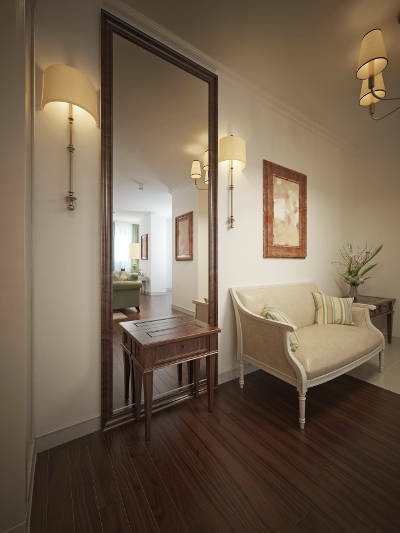 Adding a mirror is an awesome way to transform your space without breaking the bank. For a particularly tiny room, try floor-to-ceiling mirrored tiles to create the illusion of spaciousness. As an alternative to a full wall of mirrors, try a large framed mirror. Stand the mirror up on the floor or place it on a table, positioning it strategically near the brightest light source in the room for ultimate reflection! While indoor lighting is not the same as the sun’s light, it can still help boost your mood/energy level. When attempting to brighten up a dark room, adding additional light seems like an obvious fix. However, you may be failing to recognize some slight adjustments you can make to your existing lighting. Switching out current light bulbs for ones that are brighter can go a long way. It’s important to keep in mind that lumens, not watts, are the unit that measures the brightness of a light. The more lumens in a light bulb, the brighter the light. In addition to light brightness, you must consider light temperature. Just as sunlight can give us energy, certain light bulbs can have similar effects. Bulbs with high temperatures that emit blue light waves and produce cool, white light appear most similar to daylight. These bulbs are most effective in adding brightness and energy to your home. 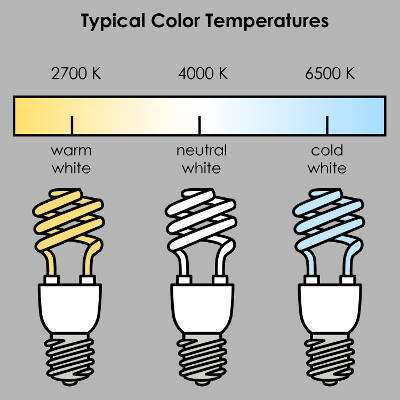 Lower temperature bulbs produce softer, warmer light creating a more comfortable feel. Be sure to also keep your glass lights clean, it’ll make a huge difference. Be sure not to forget about whats underneath your feet! Choosing lighter hues for your floors will reflect light up, bringing instant brightness to the room. If replacing a dark floor is not an option, or you have a love for dark floors, consider using lighter finish countertops or cabinetry. The tan and white color families are very versatile and contrast well when placed with dark wood floors. You can also compliment your dark floors with a light-toned area rug. If major structural changes just aren’t in the cards, consider cutting back on decor. Clutter can intensify the heavy feeling of a dark room. Instead of placing all your miscellaneous items on shelves, try keeping them tucked away in storage. Keeping things out of sight will make your room look neater, making it feel more open and bright. You may not realize how big of a difference can be made by replacing large, bulky furniture with lighter furniture. Instead of a hefty coffee table, try one with legs so you can actually see the floor. 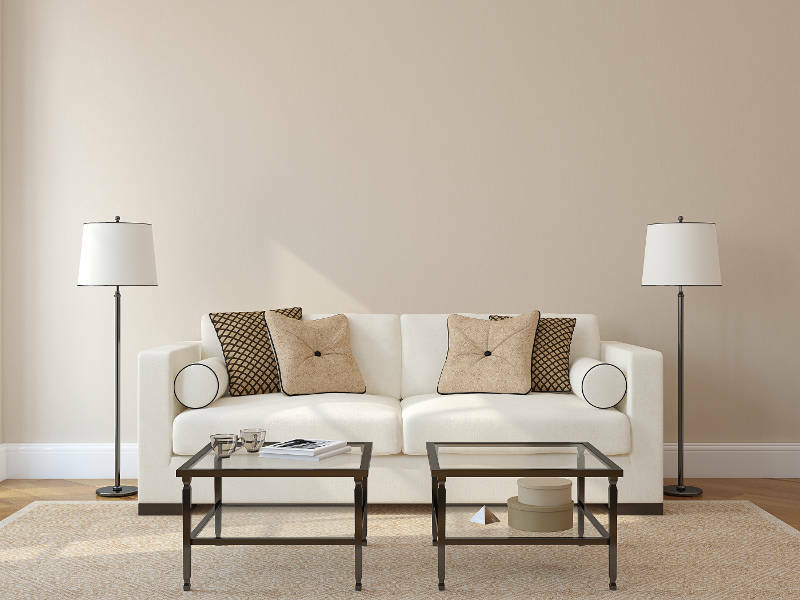 Lighter, neutral colored furniture will help to brighten up a dark room as well. 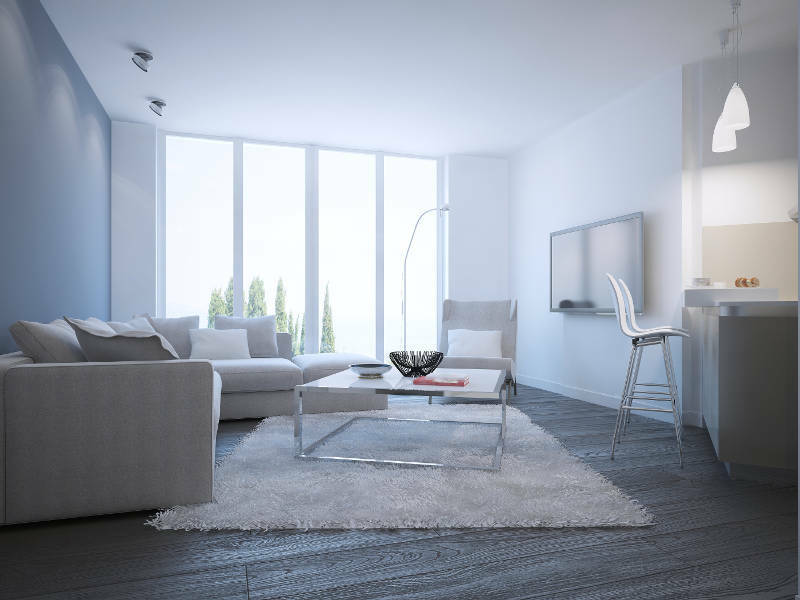 Glass and acrylic tables and side tables allow light to pass through creating a spacious feel. The best way to maximize natural light is to increase the amount of light coming in. Adding additional windows or replacing smaller windows for bigger ones will remove that gloomy feeling. Dare to go wide and tall with your windows to maximize natural light and add aesthetic appeal. Patio doors are a great option if you are seeking ultimate light exposure, as they are like a big window. You can learn more about Feldco patio doors here. Get the most out of natural light by avoiding heavy drapes and curtains. Lightweight, neutral blinds or semi-shades will let more light in while still allowing you to maintain privacy. You can also forgo drapes and shades all together and use window film for your window. Window film is a cheap alternative to large curtains that looks great. Low, dark ceilings can make a room feel smaller than it is. Paint the ceiling with a coat of fresh, white paint to immediately lighten up the room. Wood beams can also make a room feel darker. For ultimate illumination, paint them white along with the ceiling. Painting the ceiling white is a quick, relatively easy fix that can really make the room come alive. If you wish to keep your dark painted or wood paneled ceiling, consider adding recessed light fixtures. These light fixtures are installed within your ceiling, shining light downward onto your room. Are you stuck with a basement that feels closed-in and uninviting? The most difficult part of your house to brighten is the basement. No matter the amount of lighting you install in your basement, you may still be stuck with that gloomy feel. Let some natural light shine in your dark and dingy basement and install a basement window. Not only will the window brighten up your basement, but it will also provide ventilation. Brighten up a dark room by adding a house plant. Keeping a (real) plant in your room will add a pop of color and a lively feel. Snake plants, spider plants, or ferns are great choices when it comes to house greenery, as they require little sunlight and are low maintenance. When brightening up a dark room, selecting the right hue for your walls is crucial. A common misconception is that to brighten your space you must forgo color completely. While a solid white is great for naturally bright rooms, all white walls are not the right choice for smaller darker rooms. There are a variety of other hues that more effectively add the illusion of space to a dim room, giving it texture, depth and dimension. Neutral tones work best in dark spaces. Bright, neutral paints like beige and gray will make your room feel bigger and more radiant. Gray is a trendy neutral right now, suited for rooms lacking natural light. Opt for cooler gray tones such as blues, beiges and violets. If you’re lacking light and stuck with a room that feels more like a cave, challenge yourself to try a few of these tips. Not only will these suggestions help brighten up a dark room, but they will make your home feel more open. Adding light will boost your mood in addition to the aesthetic appeal of your home. With light so easily accessible and beneficial, why settle for a dark space?